Another summer weekend is upon us. If you're looking for something to do or someplace to go, check out the August program listings. If you're thinking ahead to next weekend, we have a list of which sites will be open on Monday, Sept. 7 for Labor Day. And if you're thinking beyond that, our September listings are for you. When I found out I was interning at Ephrata Cloister, little did I know that the research project I would be working on would involve a late 19th-century album. The Cloister had recently acquired an autograph album (ca. 1879-82) whose original owner, John K. Madlem, attended the Ephrata Academy, which met in the white schoolhouse on the grounds. My job was to research him as well as the other signers of his album. Every Thursday afternoon I made my way to the Cocalico Valley Historical Society where, with the support of librarian Cynthia Marquet, I worked to identify the people who wrote in the album. We were able to identify 36 of the 38 signers, which is not bad considering that all we had to go on was their names and many of them used initials instead of the full names. We learned that many of the signers became important members of the town of Ephrata. Among them was Charles S. Yeager, who along with his brother, John J. Yeager, Jr., founded The Ephrata Review newspaper, which turned out to be a valuable tool in researching the signers. Family connections were also made which gives us an idea of John K. Madlem's extended family, including first cousins and second cousins once removed. My album’s open! Come and see! What! won’t you waste a line for me? The Pennsylvania State Archives collects, preserves, and makes available for study the permanently valuable public records of the Commonwealth as well as papers of private citizens and organizations relevant to Pennsylvania history. The Archives has almost 235 million pages of records and about 1 million photographs, maps and other special media. 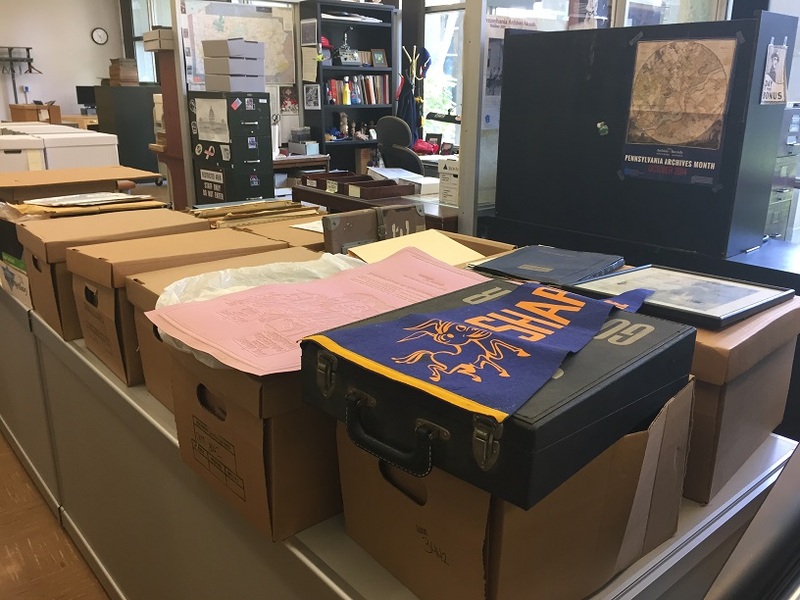 In this week’s guest post, Archives intern Corine Lehigh shares the story of how one collection of documents made its way from a garage in Merion Station (Montgomery County) to the 14th floor of the State Archives tower (and teaches us some basics of archival management). Earlier this year Richard Shapp, son of former Pennsylvania Governor Milton J. Shapp (1912-1994), contacted the State Archives about donating some of his father’s personal papers, then housed in two five-foot-tall filing cabinets in his garage. The first step in the records acquisition process is appraisal. 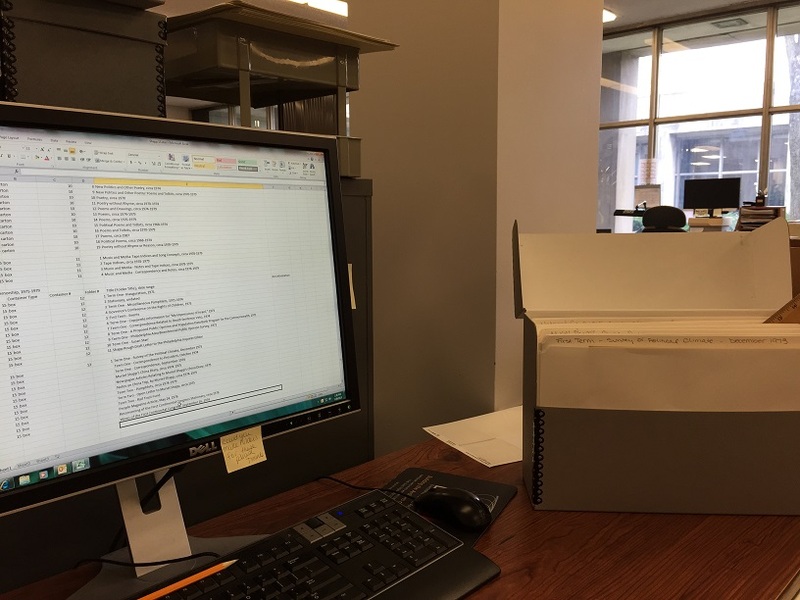 An archivist has to determine the historical value of records based on several different criteria including research potential, age/scarcity, and the size of the collection. Knowing that the information in those filing cabinets would help to fill out Manuscript Group 309, the Milton J. Shapp Papers, Archives Director David Carmicheal gladly accepted the donation. On June 30 archivist Richard Saylor and I headed to Merion Station to pick up the records. With the necessary paperwork already completed, it was to be a simple retrieval. Richard Shapp was very knowledgeable regarding not only his father’s political career but also many events of the 1970s and 1980s. He told us about Gov. 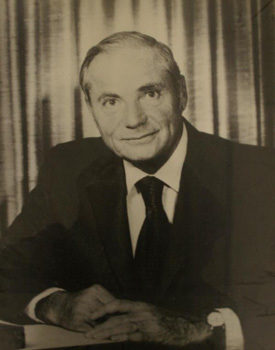 Shapp’s love for poetry and short stories—two whole filing drawers contained Milton Shapp’s own work—and shared many stories, including his father’s vision for the Peace Corps, which he shared with President John F. Kennedy in the early 1960s. One surprise we received was a folder of information regarding First Lady Muriel Shapp (1919-1999), who had taught Japanese American high school students at the Topaz internment camp in Utah during World War II. Listening to Richard Shapp talk about this collection as we packed it up made me want to process it and read into more detail all of the information we had received. After we had packed up the van with over 11 cubic feet of papers, film reels and photographs, Mr. Shapp invited us to join him for lunch. While he got everything ready we viewed what his partner referred to as his “Forrest Gump” wall. I can completely see why she calls it that! 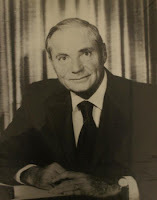 The upstairs hallway was lined with photographs of our host with some very important people including Anwar Sadat, Queen Elizabeth II, Richard Nixon and Pope Paul VI. [Editor’s note: Shapp, classically trained in opera at the Curtis Institute of Music in Philadelphia, has sung professionally in the U.S. and abroad, alongside such notables as Luciano Pavarotti and Anna Moffo.] Richard Shapp was more than just a donor; he was a generous host and a wealth of knowledge. When a record is accessioned we are taking legal and physical custody of the materials and establishing intellectual control. Once the new Shapp acquisition was back at the Archives, our first step was to note, in a very general sense, what was in each box. Then Richard Saylor typed up an accession register that included all of the basic information we had gathered thus far: the source and origin, an estimated date range the boxes covered, how many cubic feet of material before processing and what manuscript group it would be accessioned into. 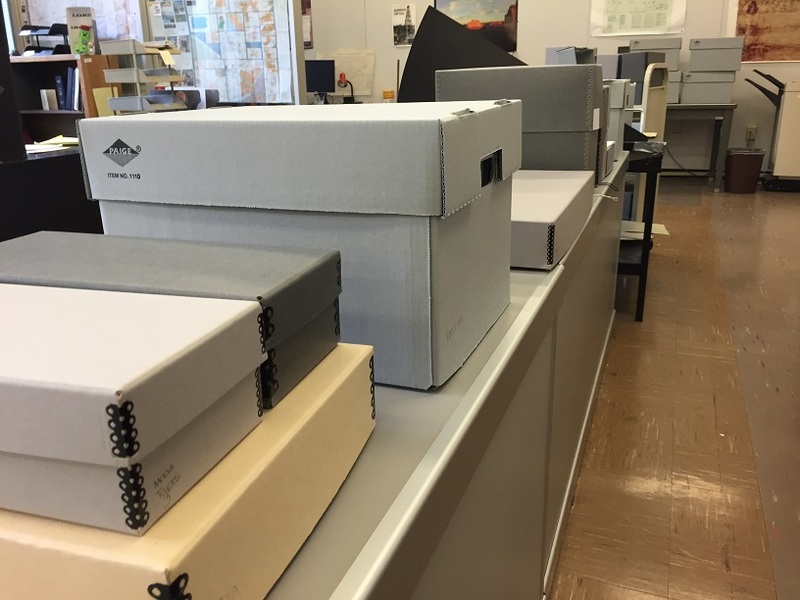 From here the boxes and accession register were given to Kurt Bell, who is the Manuscript Group processor in the Collections Management section of the State Archives. Processing is the arrangement, description, and housing of archival materials for storage and for use by patrons. First we sorted the boxes into subject groups alphabetically, and then I rehoused the documents into archival boxes. (It is important to use acid-free boxes and folders for long-term preservation; many general use folders and papers will begin to deteriorate rapidly as the years progress, leaving the records unusable.) Once the records were arranged, the next step in processing was to write a general description of the contents of each folder, bearing in mind what researchers would be looking for and what would help them use the materials. This necessitated dividing the groups by subject and then boxing them up in chronological order, which was especially important for files created during Gov. Shapp’s two terms in office. Think about your own collection of personal items. It probably includes papers (essays you wrote in high school or college, letters from friends and family members, family recipes, etc. ), photographs, videos (remember those big clunky video cameras in the ‘80s? ), and various objects (your varsity jacket from high school and maybe a yearbook, your first license plate or your wedding dress, things that were important to you). Now think about whether or not you have all of those things labeled (Central Michigan Univ. has advice on storing your personal collections). Would a non-family member be able to determine why those items were important to you? That is what processing is: determining what and why someone kept something. It also involves a lot of research. For the Milton Shapp collection I had to listen to cassette tapes, flip through several reels of film and read many of Gov. Shapp’s creative works so that I was able to determine the what, why, when and how behind the collection. Once I was done writing my series description and had thoroughly edited my folder level descriptions for the finding aid, the information was given to Kurt Bell to upload to Archon, a digital archival management program. A finding aid is a descriptive tool used to establish physical and intellectual control of archival material (meaning we know what it is and where we can find it). The finding aid outlines the materials located in a specific collection and can include guides, inventories, special lists, and container lists as well as biographical and historical information about the individual or organization. So that’s how a record goes from being in someone’s garage to becoming available for a researcher. 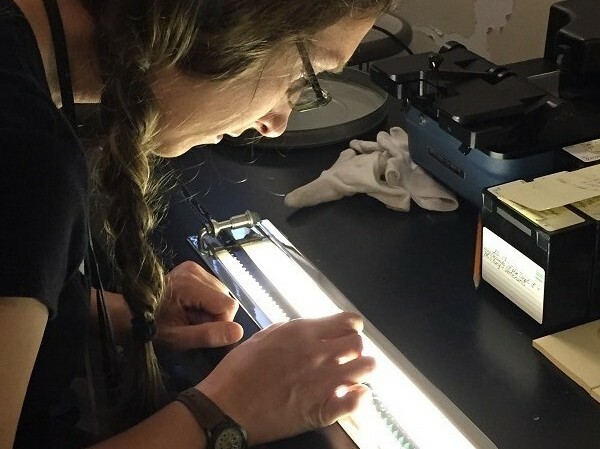 It’s an important process to help preserve records for future generations to enjoy. Hopefully this post also helps you think about your own collection of personal papers and how you can make it easy for future generations of your own family to enjoy. 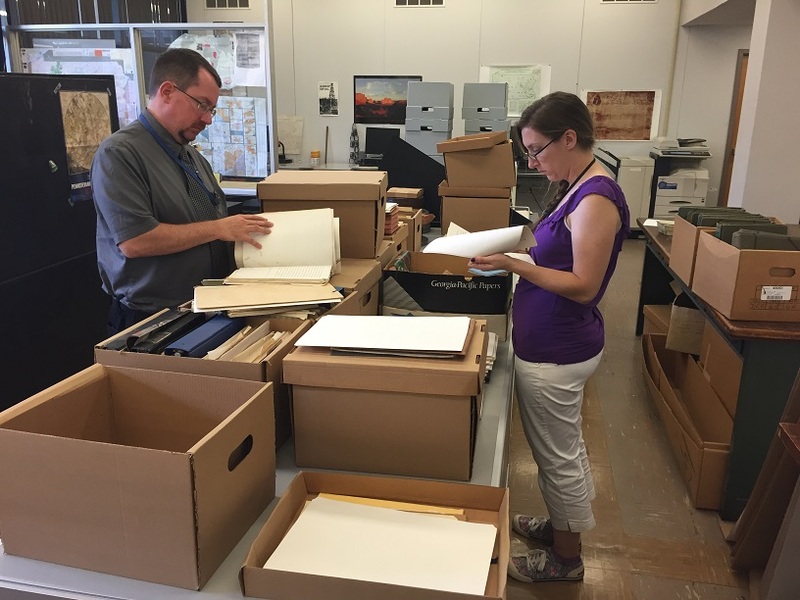 Our guest blogger today is Rachel Yerger, a curator in the Bureau of Historic Sites and Museums as part of the PHMC's Collections Advancement Project. Rachel has blogged for Trailheads before, detailing collections care efforts related to the new exhibit at the Pennsylvania Lumber Museum. 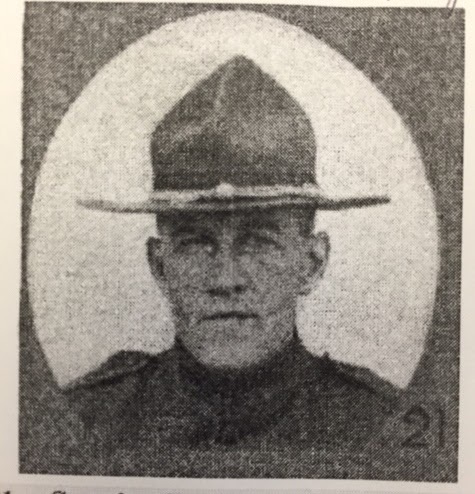 Today she shares some info about a collection of World War I letters accepted last year at the Pennsylvania Military Museum. In her pre-PHMC life, Rachel worked on the WWI digital archives project, "Home Before the Leaves Fall," at Villanova University. This past April brought the Sesquicentennial commemoration of the Civil War to an end (and man, will I miss saying "sesquicentennial"!). But fear not, military history nerds, because many World War I centennial commemorations are already underway. Even though the United States did not commit military support to the Allied war efforts until 1917, our centennial commemorative involvement is already gearing up. A few American based projects are up and running and vary in scope from national (Saving Hallowed Ground, a project launched by the WWI Centennial Commission) to local (Home Before the Leaves Fall and The Fallen of the Great War: Philadelphia Project). As other commemorative projects emerge or move forward, it is important that, in addition to the more well-known histories, we make a point to include the accounts and experiences of the common soldier. There are Great War narratives in the form of diaries, letters and postcards hiding in archives all over the country. These sources hold valuable information that can help us better understand what life was like for doughboys during the Great War. This descriptive language, the intense situations, the strength and pride with which R.S.R. closed the letter, is all reflective of the greater whole that was the Keystone Division. Because of their brave fighting at the front, the 28th Division earned themselves another nickname, "The Iron Division," given to them by General John Pershing himself. Approximately half of Company C were killed, wounded or taken prisoner. But because of the Iron Division, and the rest of the American Expeditionary Force's perseverance, the Germans were forced to retreat and suffered more losses than the British, French and Americans combined. Shorty and Harry met while Company C was training at Camp Hancock, Georgia. 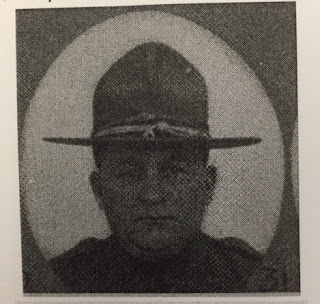 Both had enlisted from Somerset County, PA, and quickly became friends. Harry often mentioned Shorty in his letters, and when the pair returned home they remained friends. In fact, Shorty was the one who introduced Harry to his future wife. What little we know about Shorty’s life after The Great War comes from vital records and a survey of Somerset County veterans conducted by the Works Progress Administration. In a sense, we’ve learned more about R.S.R. (and the 28th Division) through this one letter than from all the compiled vital records. The purpose of commemorative events is remembrance, not just of certain larger-than-life historical figures, but also of men like Harry Campbell and Shorty Rakestraw. These men fought bravely and valiantly with the hope that future generations would be spared another war of this magnitude. We now know that this would not come to fruition, but it was not for a lack of bravery on the part of the men of the 28th Infantry Division. For me, this letter, and the other letters in the Campbell Collection, made the First World War more real than other historical narratives had before. Being able to put large historical events into a personal context is one of the more effective ways to engage people with history. And for a war that is largely forgotten, it is important that we be able to connect modern Americans to the people that experienced this war firsthand. And what better way to do that than by using the doughboy’s own words? Today's post (including photos except where noted) comes from PA State Archives intern Ryan Zsifkov, chronicling the annual Keystone intern field trip (more info on PHMC's Keystone Summer Internship Program.) If you missed it, Ryan had an earlier post on the Pennsylvania Main Line Canal. Thanks, Ryan, for the posts and best wishes for your further studies. Scattered throughout the Commonwealth are historical gems, each of which provide a glimpse into the narrative that is our past; among these gems are Ephrata Cloister and the Cornwall Iron Furnace. As an intern with PHMC I have had many great experiences and opportunities; I recently added to that list a field trip to both of these locations. Our first stop, Ephrata Cloister, was a relatively small community of German immigrants who were seeking a more personal and devout relationship with their religion. Like many others during the 18th century, they sought their liberty of conscience in colonial Pennsylvania. 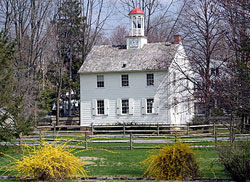 Established in 1732 by Conrad Beissel, who was exiled from Germany because of his religious beliefs, Ephrata Cloister quickly grew into a notable and independent community. They promoted celibacy and remained continuously engaged in the arts and prayer. Their life was simple, yet intentionally uncomfortable and busy. Everyone slept on wooden beds without padding and used blocks of wood as pillows. Their schedule was routine and strenuous. Each member of the community would wake at approximately six o’clock in the morning and pray for one hour. They would then get right to work in whatever tasks they had for the day, typically whatever skilled labor they had been assigned or volunteered for. At around noon they would pray for another hour and then immediately go back to work. In the evening they would all gather and eat dinner, which was typically a small meal without any kind of meat. They would then go back to work until nine o’clock at night. After three hours sleep, they awoke at midnight to await the coming of Jesus, whom they believed would return within Conrad Beissel’s lifetime; they would wait for two hours and then go back to sleep to wake the next morning and repeat the process. Their only day off was on Saturday, which was the day on which they observed the Sabbath. Such a strict schedule was intended to keep the community more focused on God and less on earthly matters. After our guided tour through some of the original remaining buildings and artifacts at Ephrata Cloister, we departed for the Cornwall Iron Furnace. The iron furnace at Cornwall is the only intact furnace of its kind in the Western Hemisphere, and in its heyday was self-sufficient. All of the resources, from the wood for charcoal to the iron ore, were gathered in the hills and surrounding areas of the furnace. Towns were built to provide housing and a sense of community for its workers. The furnace was established by Peter Grubb, who (with his father) immigrated from Cornwall, England, to Pennsylvania. A stone mason, Grubb recognized immediately the significance of the iron ore-rich hills, and by 1742 the furnace (named in honor of his home) had begun operations. After Grubb's death a decade later, Cornwall was passed on to his sons who continued to run the facility until around 1798, when the furnace was acquired by Robert Coleman. Coleman was extremely successful in the management of the furnace and quickly became one of the wealthiest men in the state. By the 1880s a newer and more efficient smelting process, fueled by anthracite coal, made the furnace in Cornwall obsolete. In 1883, after nearly a century and a half of productivity, the Cornwall Iron Furnace ceased operations. My time with PHMC over the course of the summer has been an enriching and rewarding experience. It opened my eyes to the plethora of locations throughout the state where our past is preserved so that anyone can glimpse first-hand our history, such as at Ephrata and Cornwall. Furthermore, my time here as an intern has bolstered my appreciation of our past; it has broadened my horizons and presented a multitude of new avenues from which to approach the study and preservation of history.